Ideally located no more than 45 minutes from all cities & airports in Cyprus, Limassol combines the safe, relaxed lifestyle of an island and the opportunities of a European metropolitan city with a multicultural population. Boasting excellent soft & hard infrastructure and with an outward looking focus, Limassol holds key role to the economy of Cyprus and is a major contributor to the island’s GDP. The diversified economy includes up-market tourism & leisure, corporate services, global & regional HQ of international companies, financial institutions, education and light industry such as pharmaceuticals & software. Limassol tops the rankings as a reputed upmarket tourist and leisure destination. English is spoken everywhere, while Russian is also widely used. Along the 17 km long sandy beaches, two Marinas, world renowned 5 star hotels, and a most exciting dining, shopping, nightlife and yachting scene create a year-round vibrant lifestyle well beyond the expectations of a Mediterranean island. Private schools both International & Russian, a pollution free environment, excellent healthcare, numerous children's entertainment options including extracurricular activities, 4 parallel main roads that connect the city thoroughly, the seafront promenade, public parks, are just some examples that make Limassol a favorite for the island’s ex-pat community. The ex-pat community of Limassol is very active, mainly business related and makes up between 15-20% of the population of Limassol. It includes entrepreneurs, top-level executives, white collar employees as well as High Net-Worth Individuals (HNWI) who choose Limassol for professional advancement as well as tax planning within an ideal environment for family upbringing. An Ever Growing Business Hub! Limassol, is the natural choice and heart of the island’s international business as it is home to the island’s international port / cruise hub, has a highly educated workforce, and benefits from the island’s most attractive, transparent, simple and efficient tax system for companies and individuals. World famous companies involved in the shipping, banking, investment, information & communication technology sectors, and corporate services fields have been servicing their clients on a global level from their offices established in Limassol for decades. A boom in demand for office space as well as prime residential properties has been observed recently in Limassol due to the economic instability & social unrest in neighboring countries which causes an ongoing influx of both companies as well as HNWI looking for a new, safe and efficient base between Russia, Ukraine, the MENA region and Europe. The regions Oil & Gas finds, the upcoming Integrated Resort Casino, a combination of New Tax Incentives to international companies, ex-pat employees as well as non-domicile residents and the planned Science & Technology Park are all great news for the whole island and especially for Limassol. Over 80 trillion cubic feet of gas has been discovered in offshore blocks (75% of which still is to be exploited) between Cyprus, Libya, Israel, Egypt, Syria & Lebanon and more finds are to be confirmed in the near future as per the estimates published by the U.S. Geological Survey government body. It is estimated that these reserves could contribute up-to 20% of the needs of Europe for the next 30-35 years. Limassol presents a unique option for companies involved in the industry to set-up their base. The oil and gas bonanza will the island's economic base once and for all. A series of tax incentives including non-domicile rules for individuals, capital gains, high earners exemptions, all of which aim to simplify the Cypriot tax regime have been recently introduced. As the island’s established international business center and pole of attraction for HNWI’s these new taxes, will further benefit Limassol. Expected to be operational by 2019, and boosted by the new tax incentives, this is expected to attract R&D companies as well as creative professionals of the region, looking for a stable environment to grow professionally and financially. Limassol, will be the main beneficiary as the pre-selected area of Pentakomo is just 10 minutes’ drive from Limassol. With the science and technology park, the government’s plan is to create a robust R&D industry which will contribute to the island’s innovation culture and enrich the production base of the economy. Dynamic Cities are Constantly Changing! In an attempt to cope with the city’s current demands and gearing up for the future, the municipality has planned a pivotal shift to Limassol’s business, education, entertainment, leisure & residential scene. Over 1.5 billion EURO has been invested over the last few years in the westrn part of Limassol, by the vibrant city center and alongside the sparkling waters of the Mediterranean. Limassol Marina, as well as various EU & Government funded regeneration projects such as the Seafront Promenade, the Limassol Embankment, the Old Port, the City Center & the Medieval Castle square and the Cyprus University of Technology, have all signaled this shift. End Point: Church of Timios Stavros, Kouka, Lemesos. Limassol Marina, as well as various EU & Government funded regeneration projects such as the Seafront Promenade, the Limassol Embankment, the Old Port, the City Center & the Mediaeval Castle square and the Cyprus University of Technology, have all signaled this shift. The final phase of this shift, “Aktaia Odos” will be the most compelling one as it will create tomorrow’s city today. The municipality of Limassol aims through master planning “Aktaia Odos” to create a technologically advanced city-within-a-city, which will be the new home for the island’s international business community and a magnet for new companies & creative professionals on a global scale. The areas spectacular regeneration will balance increased density development in high-rise buildings, redevelopment of listed buildings and public open space, to create extraordinary residential, work & entertainment space. EDEN Beach Apartments: Located right by the sea & the city center of Limassol and offering prime located apartments at a most reasonable price, EDEN Beach Apartments, has been one of the island’s fastest selling developments, with 99% of its 122 units now sold. Pissouri Villas: Located on a hill just a few minutes drive from the beautiful bay and the luxurious Columbia Beach Resort Hotel, Pissouri Villas offers spacious villas on big plots, within a superbly master-planned development half way between Limassol & Paphos and is 90% sold. Zanatzia-Souni Plots: Located in an area with people looking for spacious houses in well sized plots within a short drive from Limassol and at an affordable price, Zanatzia Plots are a good option, away from the buzz of the city. The plots are already separated and have title deeds, water & electricity provisions, road network and pavements. A unique landmark of the island for the years to come, Limassol Del Mar will be located in the most luxurious and fresh neighborhood in Limassol, by the sea. 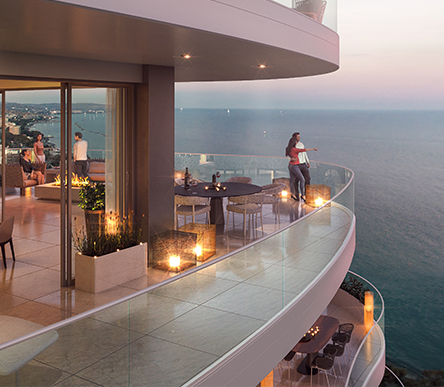 Rising up-to 25 floors, it will offer 168 direct sea-facing residences, duplexes & penthouses as well as 31 direct sea-facing commercial units to be used for retail as well as gastronomic purposes. A “Serviced Living Lifestyle” will be offered through the facilities and services to its residents including direct sea facing resident’s club house / cafeteria, indoor and outdoor pools, gym, spa, sauna & Jacuzzi areas. Furthermore it will offer 24hr concierge / security services, underground parking as well as in-house housekeeping and property management. The project is about to be launched and will take advantage of the fast growing HNIW market. Almost attached to the 1st licensed 18 hole professional golf course development in Limassol, and in one of the city’s greenest areas, Tiffany Gardens was conceived as a getaway from the buzzy city, but still within a very short drive. Overlooking the bay of Limassol from the pine forest of Souni and just 20 minutes’ drive from Limassol, Souni Plots & Villas, is a great investment opportunity. It neighbors a well-established upmarket development of luxury villas and it is within walking distance from all facilities and amenities of the village of Souni. The project is already licensed, with the flexibility to offer a gated community with upmarket villas of various sizes, types and budgets.